Emerging from the cartoon is an eye-catching scene that a man is separated into two parts, with one part representing the living standard, which is in a leading position and very rich, while the other part the moral stand, which is, on the contrary, very poor and is left far behind. Simple as it is, the symbolic meaning revealed is profound and thought-provoking. We are supposed to place our attention on, instead of its funny appearance, the implied meaning of the cartoon: improve as the living standard of some people may, they do not have their corresponding moral standard match at the same time, which is getting increasingly serious in our modern society. What can account for this undesirable situation? For one thing, they are lack of awareness of being responsible for the society, for they consider profit as their main and only target. For another reason, the relevant laws and regulations to punish those who go against moral standard are still far from perfect yet. From what has been discussed above, it's safe for me to conclude that it is urgent to take some immediate and effective measures. What I recommend is that we citizens should strengthen self-cultivation, to enhance the awareness of moral establishment. 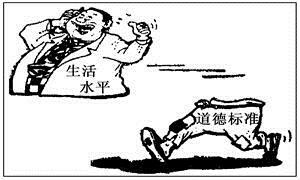 In addition, the mass media should shoulder the responsibility to assure all the people the necessity of improving economic situation and moral standard at the same time. Only in these ways can this kind of trend will be curbed in the near future.